Welcome to my ultra-nerdish page! I've frequently read that a problem with such and such a lens is that its filter thread is 40mm, an obsolete size for which there are only old filters and hoods that are hard to find, overpriced, or both. I have two such lenses and have had no trouble finding new doodads to screw into them. On occasion I've explained to mailing lists, etc., where I've got them, but it occurred to me that it might be simpler just to put the information into a single web page. (I was wrong; this has taken hours.) Well, here you are. In addition to 40mm threaded filters, you could keep an eye out for a 42mm clamp-on filter holder and the filters made for this. These were marketed for lenses for large-format photography. They ought to fit, but of course might not. I list here the kinds of filters that many people rightly or wrongly leave on a lens most of the time. All of these are from Kenko. Kenko also sells polarizing filters in some small sizes, but their link wasn't working the last time I tried. Meanwhile, here is the announcement for 39mm, 40.5mm and other sizes (but not 40mm) at ¥8000; here is the announcement of a matching polarizing viewer. 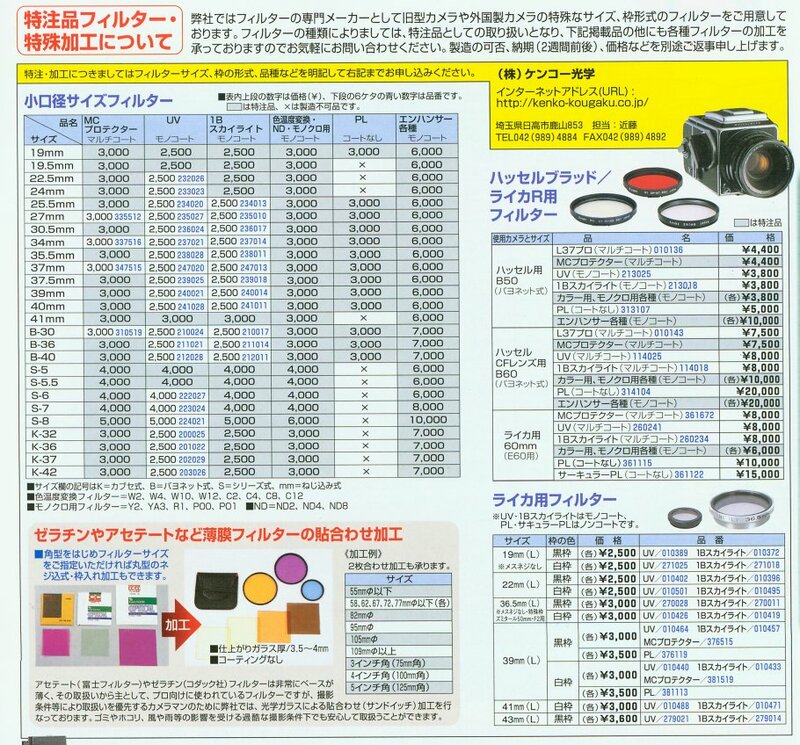 The catalogue shows 40mm and other polarizing filters for ¥3000, surely the result of a misprint. As "yama1yamajp", the maker of vented hoods sells them (as "Yama special parts") on Yahoo Japan's auction site. ("Seller will not ship internationally", says every relevant page.) He or she also has them sold on commission by the Shinjuku branch of Kamera no Kimura, and perhaps elsewhere. Or of course you can make your own. Hansa sells a black or silver push-on cap for ¥4000. That strikes me as exorbitant; it's more than what you pay for a Hansa hood and cap (see above). The outside diameter of these lenses is about 42mm, and Schneider and other manufacturers have made caps marked "42mm" that fit these lenses (and lenses with 40.5mm thread too). Kenko appears to be the biggest manufacturer of filters in Japan. Its website is here; when I last looked, English-language pages were promised but had not materialized. I believe that Kenko and Hoya filters are the same: Hoya is the name used for much (all?) of the world outside Japan, Kenko for Japan. Shown here (left or above, depending on your browser) is the front cover of the Kenko catalogue distributed in early 2004. 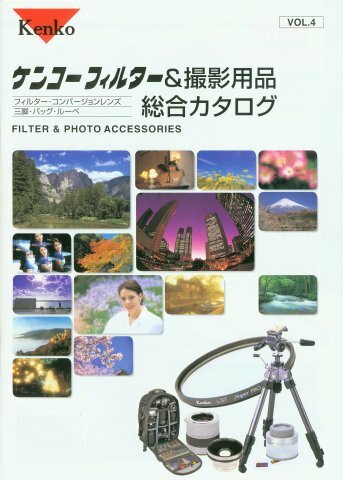 This scan from it shows the filters mentioned above, as well as 40mm polarizing filters (¥3000, surely a misprint) and filters for many other sizes. 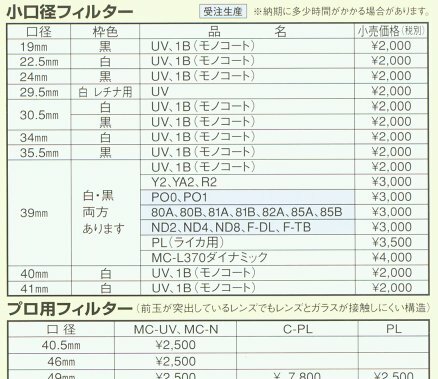 It also includes a statement that Kenko will consider requests for filters not listed even as special-order items. 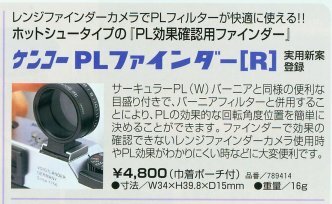 This scan shows a "PL finder" (¥4800), a polarizing previewer to plug into an accessory shoe. There's additional information of stocks of small- and odd-sized special-order items here. Kenko does not sell online (even for customers with Japanese addresses), and when I last checked did not divulge an email address. Hansa is the brand used by the Omiya Photo Supply Co. Ltd. Omiya's website is here; Hansa's is here. Both sites are in Japanese only. 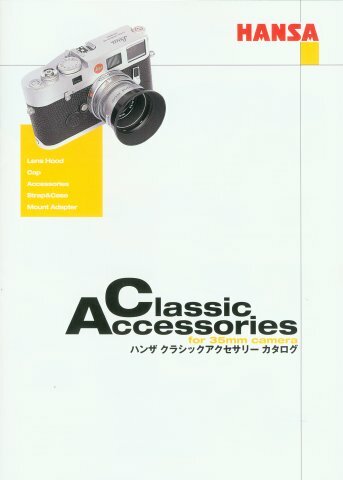 Shown here (left or above, depending on your browser) is the front cover of the Hansa "Classic Accessories" catalogue distributed in early 2004. 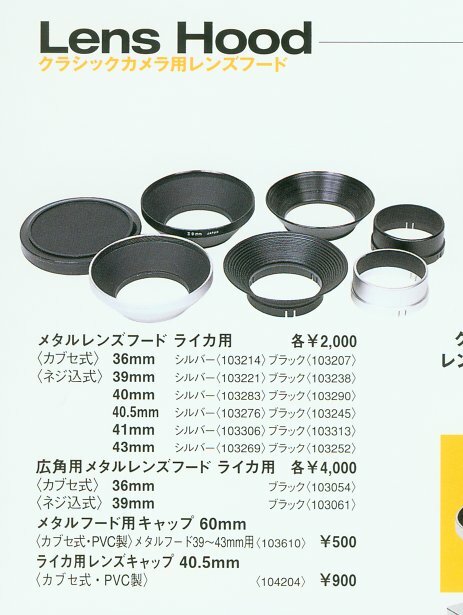 This scan shows the hoods (39mm, 40mm, 40.5mm, 41mm, 43mm) and hood cap (as well as some other stuff); this one shows caps in the same sizes (plus 36mm); and this one shows the filters (24mm, 30.5mm, 39mm, 40mm, 40.5mm, 41mm, 43mm, as well as 19mm in black only). Omiya/Hansa does not sell online (even for customers with Japanese addresses), and when I last checked did not divulge an email address. 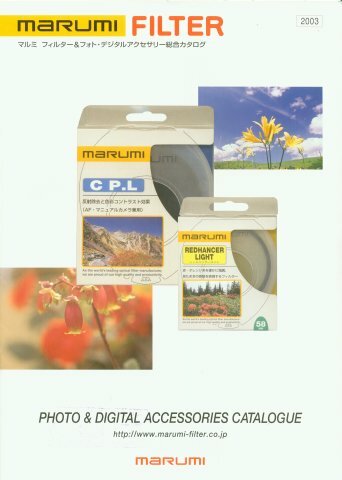 Marumi Optical Co., Ltd. is the other big Japanese maker of filters. Marumi's website is here; its very much smaller English-language site is here and has a link ("Contact") to email addresses. 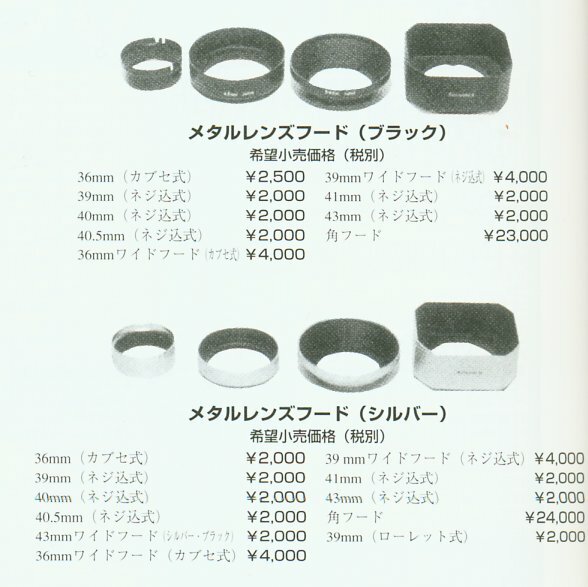 Shown here (left or above, depending on your browser) is the front cover of the 1993 Marumi catalogue. This scan shows 40mm and other smaller filters. 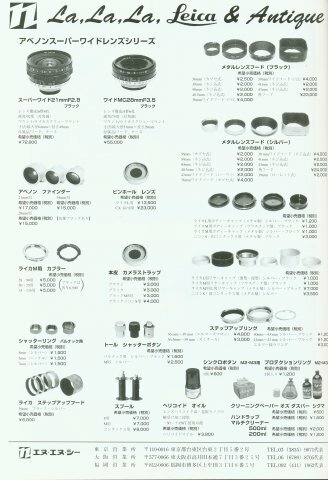 In one of its Japanese-language web pages, Marumi says that it will consider special orders for unusual filters. Marumi sells a great number of step-up and step-down adapter rings, but unfortunately nothing for 40mm. I know very little about NNC, and can't find a website for the company, let alone an email address. It sells, or until recently was selling, lenses labeled "Avenon" in Japan (and "Kobalux" elsewhere), but its hoods come in packages with the NNC brand name. Shown here (left or above, depending on your browser) is a recent magazine advertisement by NNC. This part of it shows the 40mm and other hoods; this one lists step-up rings. What's above was written in 2004. Availability and prices have doubtless changed since then. The good news since then is that the excellent Japan Exposures now sells Japanese photographic items — toys, accessories, film, books, whatever — from Japan to customers around the world. They'll get you something as small as a 40mm filter, though it would be sad if you didn't buy a dozen or so books while you were about it. "If you have so many gee-whiz accessories and exotic old lenses, how come your photos are such crap?" will no doubt be a Frequently Murmured Question. First, I don't have that many. (Notably, I have a grand total of two 40mm filters.) But the fact that I do have some, rather than none at all, is precisely because my photos are such crap. Ken Rockwell's article The Seven Levels of Photographers explains. Further reading: the same author's Why your camera does not matter. First created: 26 February 2004. Last fiddled with: 1 April 2004, for the most part; but one important update in May 2010. My thanks to David Goldfarb and Christopher Chen for their comments made via a photo.net message thread.